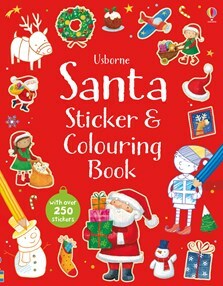 Lots of Christmassy scenes to colour in and complete with stickers as Santa gets ready for his busiest time of the year! Help Santa pack his sleigh, complete his band of reindeer and decorate a Christmas tree. With over 250 stickers of elves, reindeer, stockings, presents and delicious Christmas food. The perfect gift to keep children busy during the run-up to the festive season. With stickers of elves, reindeer, stockings, presents and delicious food, and plenty of pictures to colour in along the way, this is an enchanting introduction to the magic of Christmas.